Although I don't take a lot of photos of them, there are plenty of interesting patterns throughout Disneyland Park. One only has to find the right perspective or keep an eye out at the right angle. 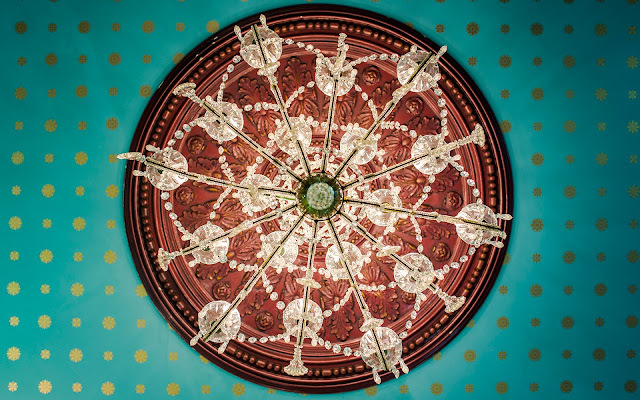 Take Cristal d'Orleans... it's lavishly furnished and and charmingly stocked with all sorts of beautiful glass works, but one of the most ornate is right above everyone's heads... in the form of a chandelier that shines brightly over the boutique space. Look straight up, and it shows off several patterns. I find that pretty nice. Looking up at the chandelier of Cristal d'Orleans. Albert, I've been following your blog since its debut and I've always enjoyed your perspective on the Anaheim park. As a non-season pass holder, you offer a window of fun and enchantment to those of us who can't frequent the park weekly or sometimes annually. Of all the facts and points of interest I pride myself on knowing as an enthusiast, this photo is quite REMARKABLE! I've probably only glanced up at this chandelier once or twice in the past thirty years. I can't wait to point it out to my friend (who, at 27, has not been to Disneyland in nearly two decades) during our upcoming visit next month. Thanks for sharing your work. It's truly inspirational! Oh man, Jason, thank you so much for the very kind words! To read that you've been following along since the beginning is very flattering, and I'm glad that you enjoy these trips to my home(s) away from home. That was my intent with starting this blog. I can't take all the credit for this shot. I was with a photographer friend who looked up and noticed the angle first. So she technically deserves the true kudos. Haha.